Except for the colored inlays in rings and the occasional use of colored glass, Etruscan jewelry is typically monochrome. One of the few exceptions is this dress ornament and its lunate setting above the charioteer which probably held a colored inlay. The filigree ornaments on the upper extension might have been used as cloisons for enamel. More a miniature relief object than a personal ornament, this piece is unique in shape and style, but the workmanship of the figural representation clearly identifies it as Etruscan. 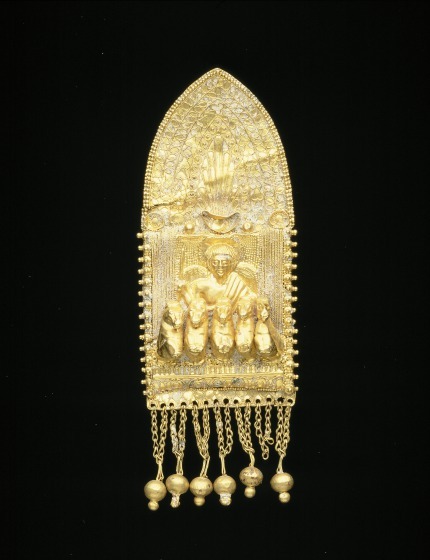 This elaborate construction of sheet gold has a rectangular panel featuring a repoussé relief of a winged man in a chariot with five horses against a stipled background. He wears a toga and a "halo" and holds a kentron in his raised right hand. The horses are rendered in full relief, each made of two stamped halves. The area above is covered with ornamental bands arching around a central panel, which is filled with the elongated leaves of a tall palmette. The designs in the arched registers are separated by plain filigree lines. All are executed in remarkably fine filigree. 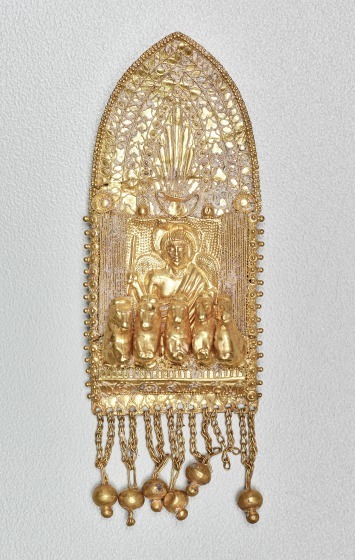 Although no parallel for it is known, this pendant fits perfectly well into the stylistic and technical picture of Etruscan jewelry and art of the later 5th and particularly the 4th centuries BCE. 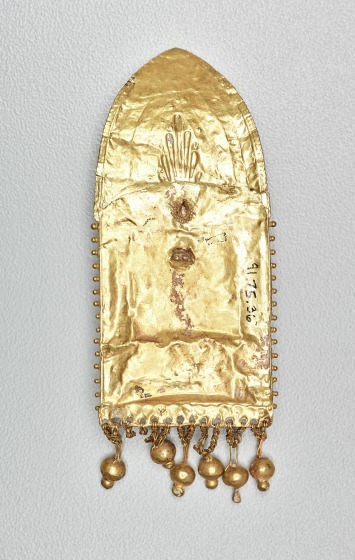 Barbara Deppert-Lippitz, Ancient Gold Jewelry at the Dallas Museum of Art (Dallas: Dallas Museum of Art in association with the University of Washington Press, 1996), 38; 130.